The mirror is exquisite!!! Can you tell me where I can purchase it? Thank you so much! Had a wonderful holiday, hope you did. Thank you for viewing our work. We appreciated all of the views from all of our clients and viewers. As an interior design firm, we take pride in finding unique items for our clients. All of the items in our portfolio and for our clients have been painstakingly selected for the various projects we undertake. Should you wish to purchase these items or need assistance on other items, feel free to contact our office to engage our services. Where can I find the floor lamps? - Where can I find the floor lamps? what color is on the walls and trim? Thank you for your interest in our work. The sconce is available through our company. Please contact us directly at Kennethdavisinc@optonline.net for further information. The sofa was custom designed by our firm. We had our upholsterer manufacture it based on our specifications. The fabric and bullion fringe are com. If you require additional information, feel free to contact our firm directly. Thank you for your interest in our work. 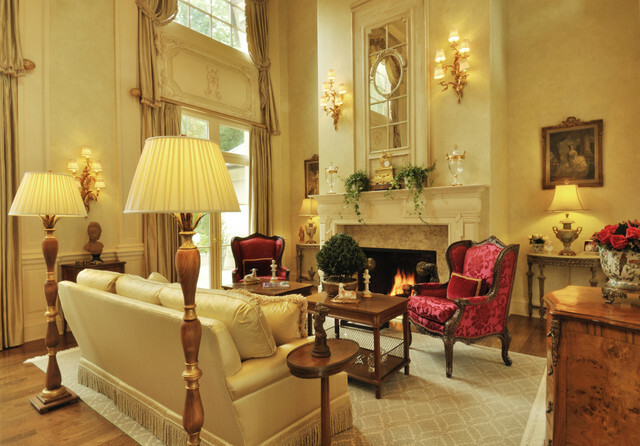 Formal French Living Room on Philadelphia's Main Line.